Betti (Merli) is a Cop On The Edge who is brought to Naples to help bust up the protection rackets plaguing the city. The top brass doesn’t necessarily approve of his unorthodox methods, but you can’t argue with his results! It seems the crime wave Betti has been called upon to stop is being promulgated by “The Generale” (Sullivan), and he’s intertwined with businessman Francesco Capuano (Saxon). Along the way, Betti befriends a sassy young boy, Gennarino (Deda, who reprised this role in the Violent Protection spinoff movie Weapons Of Death (1977)). Now Betti must wage a one-man war on crime and the baddies are going to wish they had some protection from this violence! 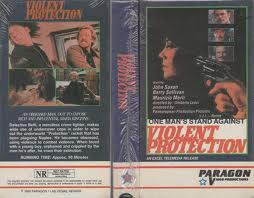 Violent Protection is an entertaining and worthwhile entry into the Poliziotteschi genre. 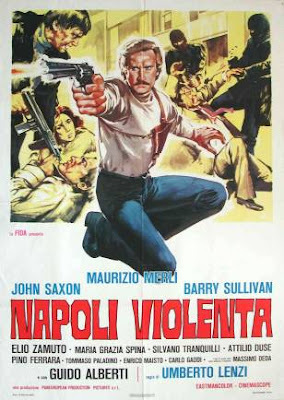 Italy in the 70’s was having some real problems with crime and kidnappings, and these hard-hitting cop movies came along to exploit that situation. Luckily, most of them are actually good movies that are highly watchable. Umberto Lenzi, like many of the directors of his generation, was a journeyman-style artist, a man versatile in every genre - Spaghetti Westerns, Giallos, Crime movies, Peplums, War movies and more - but is seemingly most known for his horror output in the 80’s, like Cannibal Ferox (1981), Eaten Alive (1980) and the wonderful Nightmare City (1980). He brings his best attributes on board for Violent Protection, and the results are worth seeing. Maurizio Merli was a mainstay of the genre, and it’s no wonder, he’s perfectly suited to the part of the determined and mustachioed cop. John Saxon also pops up a lot in these genre movies, and Barry Sullivan rounds out the cast of well-known names. There are plenty of memorable action setpieces, from the high-speed motorcycle chase to the scenes in the bowling alley and the train. The dubbed version has some interesting choices of dialogue, where characters call each other “You crud!” and “Ya fathead!” in that classic yell-y dubbed way we’ve all come to know and not love. But the excellent score by Franco Micalizzi pastes everything together nicely. While the movie was released on one of our favorite VHS labels, Paragon, seeing as it’s a dubbed and pan-and-scanned release, a cleaned-up widescreen DVD would do the presentation of this fine movie a lot of good. Maybe MYA or Raro will take the case soon. There is a great end-credits song, “A Man Before Your Time”, which, confusingly, is said to have been played by The Bulldogs, but recorded by The Blue Jeans. We’re not entirely sure what that means, but check out the song at the end. In all, Violent Protection should please both fans and newcomers to the Poliziotteschi genre.